Found these in an arroyo in southeastern Colorado. I am really interested in what exactly they are. Comments for 100 million years old? 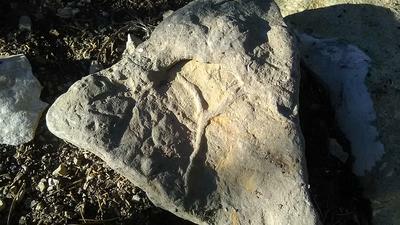 ms riverbluff - tn naked mouse rock fossil ? Looks like you have found some fossil burrow-fills. A small creature (worm or crustacean, maybe) burrowed down below the sea floor at the time and left behind the evidence of its activity - perhaps feeding or sheltering. This is why they are generically called "Trace Fossils" rather than "Body Fossils" as they are traces of the lives of living creatures recorded in the sediments. Assuming you found this near Model it is from the Cretaceous Period. which does make it 65 to 100 million years old. I can't identify any fossils on this piece but it looks like there may be more than one.